There seems to be a sense of panic amongst many Democrats. I've spoken to a number of life-long Dems in the past couple of days and the general sense I get from many of them is a feeling of displacement. They're worried that they no longer share the values (sorry for the use of the buzzword du jour) of the majority of Americans. They're worried that a true blue person doesn't quite fit in an increasingly red country. While it's certainly right for Dems to take note of the fact that we're getting whooped right now, this should be done with an honest assessment of the real facts. 1) From what I've read, the evangelical vote was actually no higher in 2004 than it was in 2000. The country has not shifted as dramatically as many people think towards being a religious state. 2) The fact that "values" was listed as the number one issue for the majority of voters is a bit deceiving. Values is a somewhat ambiguous word and I think for many voters, they simply lumped an uncertainty about what Kerry stood for as a values issue. I view this as largely Kerry's fault for not being able to stand up to his handlers on what he should say, and consequently shifting messages way too frequently. However, more importantly for the future of our party, I really believe that this is a direct result of a broken platform with an unclear message. Until Dems have an easily understood set of pillar issues, I would expect this misunderstood "values" vote to keep rearing its ugly head. 3) Over 55,000,000 voted for John Kerry and a large portion of those that voted for Bush, did so more because of Kerry's shortcomings, because of the war, because of uncertainty about the actual degree to which Bush's conservative agenda will actually be implemented, than because of any dislike of progressive values. 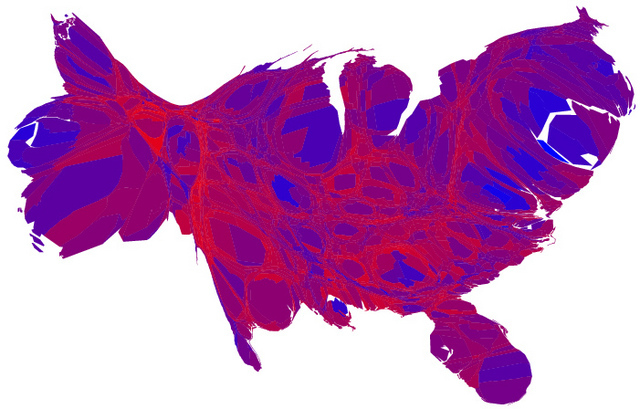 The reality is that we live in much more of a purple nation (click on the image above or the link to see the blown up map - and here's a link to a whole slew of intereting maps) than current Dem panic would suggest. So, let's not get too carried away being depressed about losing the America that we all love as an ideal and as a country. It's still here. And the best thing that Dems can do with all of their current energy is start applying it to doing things like figuring out what the new message ought to be for the progressive movement, what new organizations need to be put in place, and what new leaders need to be brought to the fore. I expect the NDN to play a large role in helping us get there. They're helping to bring more and more people into this discussion (you can read about it on the NDN blog) on a daily basis, and have been leading it in a positive direction for years now. That's where I'll be turning my post-election "depression".